It has definitely been a season to remember, filled with intrigue and excitement. Starting in the summer of 2010, LeBron James’ free agency, then followed by the ups and downs of the Miami Heat, the rise of Blake Griffin, no pun intended and the Carmelo drama. But these are only a few of the compelling stories that occurred this season and it is all being concluded with these playoffs. I’m not sure if this season could have been scripted any better because it has been great television all round. Last night’s game between the Grizzlies and Spurs is a perfect example of why the NBA and sport, in general, makes for great entertainment. The two teams knew what was on the line and went at it for 48 minutes, turns out that this wasn’t enough to decide a winner as the final minute of the game would have had anyone, sports fan or not, on the edge of their seat. I know I definitely was. I was anticipating the upset to be completed when Memphis had gained a bit of momentum at the end of the third quarter. However the veteran Spurs didn’t go away, the Grizzlies’ lead was cut to one on a George Hill lay-up with 37.9 seconds left. Zach Randolph was clutch on the next play hitting a mid-range jumper which was thought to be a dagger. What followed was a Ginobili lay-up, Randolph making a couple of free throws, then Ginobili hitting, what seemed to be a three off a broken play but was reviewed and called a two as his toe was on the line. 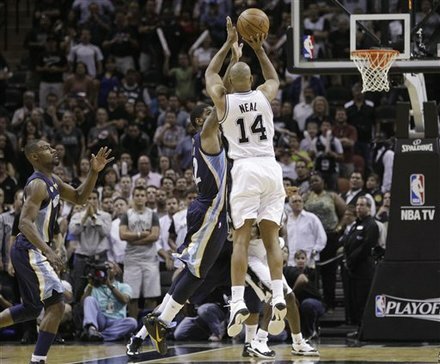 The Spurs had to foul again and Randolph once again iced both free throws. With 1.7 seconds left the ball went to Gary Neal, taking one dribble and draining a three with Mike Conley contesting the shot as time expired. Overtime followed and it was the Spurs that made their shots, denying Memphis from completing what is probably one of the biggest upsets in professional sports. The final score favoring the Spurs 110-103. Memphis will have to wait until Friday to get another shot at moving into the second round. Its games like these that cannot be compared to any sort of scripted or reality TV shows. The great thing is that the playoffs are still in the first round and you can only expect them to get better as the stakes get higher. Do you have thoughts on this topic? Reply in the comments section. We are on twitter follow us @hoopsweblog. Subscribe to get regular updates about what’s happening in the basketball world.